Year in Review: Pedro Strop has quietly been one of the best, most consistent relievers in baseball over the last five years, with DRA marks 30-50 percent better than league average and ERAs in the twos to match. I profiled Strop last offseason as well, and, really, nothing much has changed. While his 2016 strikeout and walk rates were career bests, his 2017 was only a small degree “worse,” as he remained the best reliever in the ‘pen not named Wade Davis. By some metrics, though, 2017 was also his worst season in Cubs pinstripes, as both those walk and strikeout rates crept in the wrong direction just enough to sink his strikeout-to-walk percentage to 15.6 percent. This year’s iteration of Strop featured a new pitch, too: a cutter, which nearly halved the percentage of sliders Strop threw. It was a very effective pitch for the righty, as hitters managed only a .161 batting average and .194 slugging percentage against the pitch. Interestingly, Strop deployed his cutter almost equally to righties and lefties, using it in all counts to right-handed hitters and mostly when he was ahead of left-handed hitters. That led to some reverse splits, as lefties only hit .176/.265/.233 versus Strop, striking out 28 times in 102 plate appearances. That’s a marked change from his previous years, which featured better numbers versus righties. 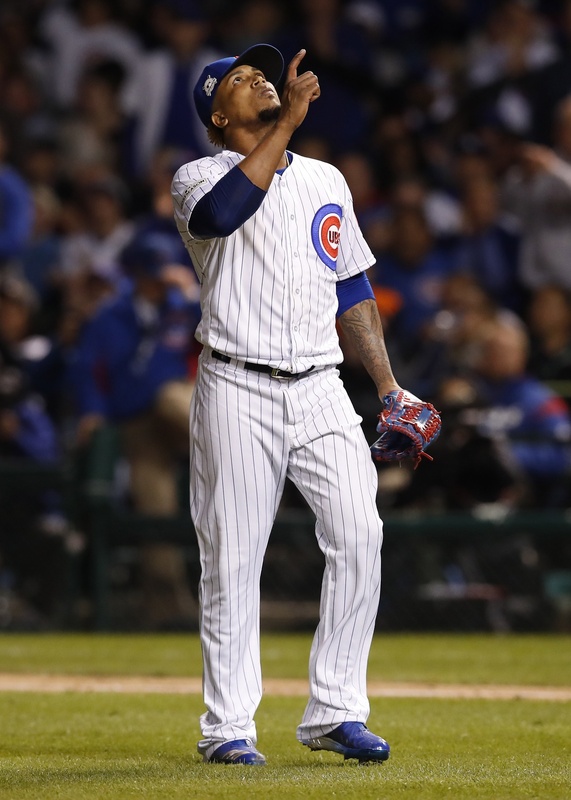 After finding himself the odd man out in last year’s playoff run, culminating in aWorld Series win, Strop found himself the second most trusted arm in the Cubs bullpen this postseason, tossing 5 ⅓ innings of one-run ball versus Washington and Los Angeles. That nearly equalled last year’s 5 ⅔ innings in the playoffs, despite the Cubs’ shorter run. This is partially a function of the bullpen’s composition at the time of the playoffs—Justin Wilson and Koji Uehara were ineffective and injured, respectively, Hector Rondon was coming off an injury, and Carl Edwards, Jr., had command and consistency issues—but also partially due to Strop’s strong finish to the season, allowing no runs in 13 appearances from August 29th onward. Looking Ahead: In last year’s player profile on Strop, I posited that he might be forced out of setup duty due to the emergence of Edwards and the clear lack of trust Maddon displayed in Strop last October. I was only partially correct, as Edwards did snag some late-inning opportunities from Strop, but Maddon vested his trust in Strop once again. Going into 2018, the bullpen picture is considerably hazier. Wade Davis might exit via free agency, leaving the ninth inning open for either a free agent closer (Greg Holland? ), a surprise closer via trade like last year, or a new opportunity for Strop or Edwards. Judging by Edwards’s postseason and Maddon’s tentativeness in using other pitchers in the closer’s role, it seems like the Cubs will acquire a closer, or re-sign Davis. That means Strop’s role probably doesn’t change very much, which is good for him. Will Strop’s walk rate continue to creep up, as the Cubs bullpen has been trending? Or will new pitching coach Jim Hickey and the Cubs’ new commitment to fewer walks help Strop reign in that number? Either way, the crooked-hatted righty should be the key fixture among the Cubs’ cadre of relievers, offering a steady presence in the seventh and eighth innings. Perhaps it’s good that I have little to say about Strop this year—it’s a luxury to have such a dependable reliever year in, year out. The Cubs will surely be on the hunt for more like Strop. CUBS OFFSEASON TARGET: Jackie Bradley Jr.